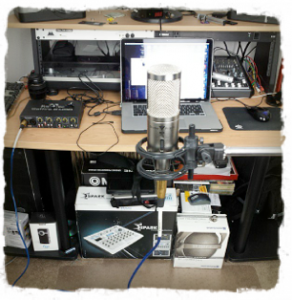 Home » Diymb Blog » Home Studio: What Microphones Do You Have In Your Arsenal? Home Studio: What Microphones Do You Have In Your Arsenal? Microphones are to musicians what camera lenses are to photographers. The only difference is, there are more inexpensive “quality” mics on the market for those operating on small budgets than there are for photographers. One of my favorite condenser mics. It’s affordable, equipped with 3 pickup patterns and it sounds good. Cardioid – good for vocals as well as instruments. The cardioid rejects sound from the back as well as the sides. For best results place the source directly in front of the mic. Gain staging and distance should also be taken into consideration. I like to position my source 6-12 inches in front of the mic. Omni – This pattern will allow the mic to pick up sound from all around the mic. That would be 360 degrees. What some people don’t realize is the Omni pattern is more natural sounding than the Cardioid pattern because it’s flat. I like to use this pattern for acoustic instruments as well as capturing reflections in a room. 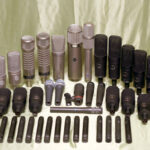 I use this mic for recording choirs, vocals, foley, instruments (all types). Aside from it’s versatility, I love it’s edgy sound. Another large condenser mic. I’ve owned it since I was about 16 years old. It was actually my 1st condenser. Funny story about this model. I did an A/B comparison with a U87 and it sound damn near identical (except for the high end). I use this mic for recording choirs, vocals, foley, instruments, ambiances etc (everything). I like it a little better than the B3 because of it’s overall quality. This is the cheapest large diaphragm condenser mic I have in my arsenal. I purchased it a few years ago because it was on sale ($70), and I wanted to try a a mic from Audio Technica (I do that sometimes). What I love about this mic is it’s clarity. There’s a little warmth, not to much, as it’s a smaller large diaphragm condenser mic, but it still does a pretty good job on the low end. A little bit of everything. I find it to sound really good on female vocals as well as males with light voices. If you record Blue (Temptations) or Barry White, you’ll loose some of that natural rumble they have. Having their computer in the same room they record in. They end up fighting fan noise throughout the entire mixing/editing session. This wasn’t an issue with the 2020 surprisingly. Just make sure you aim the back of the mic at the sound you don’t want in the recording. This is a USB version of the AT2020 condenser mic. It only has 1 pattern (cardioid) and is great for voice overs and laying down ideas. Very sensitive to noise, almost unusable in a normal office environment. Axis sound rejection? Mmmm…. Not good at all, so it’s important to control the background noise as much as possible. Despite the flaws mentioned above, the AT2020 USB has a really clean sound. It’s is good for recording vocals, instruments and perfect for voice over work. A lot of home studios over look small diaphragm condenser mics. They’re really good on stringed instruments and capturing transients. What brought my attention to the MXL 603’s is the fact that they mimicked the rode nt5 . The rode is a little warmer, but at $50 a mic (at the time), I could deal with the slight loss in warmth. Not to mention, warmth was not a concern. Snares, hi hats, darker symbols and other types of high-end shimmery like sounds. It really brings forth the detail in the instrument or source you’re recording. It even sounds good on vocals if lipsmacking and other details are what you want to capture. For the money, the 603s is a perfect alternative to the rode nt5. Yes I have 2 condenser mics made from shotgun shells. One is Cardioid the other is Omni. I use them when I’m on the go as they’re easy to carry around (right in the pocket). The downside is they have low SPL which makes them very easy to overload. Every home studio should have a shure SM58, it’s one of the best dynamic mics out there. Starting out, I needed a good vocal recording mic that wouldn’t break me. The SM58 was the answer. Before purchasing, I read a lot of of reviews going on about how durable it was, they weren’t kidding. I’ve dropped, tossed it around, run it over with my car, exposed it to high volume levels, submerged it in water and had a dog chew through the wired mesh and it still worked perfectly. I did however get a new wired mesh to prevent plosives. Most mics distort or damage at high SPL, the SM58 handles high SPL with not problems. Mostly for recording vocals. Not only is it perfect for live vocals, but it’s good for studio applications as well. Its a classic, been in the recording industry since 1966 and keeps getting better. I also use the SM58 for miking drum kicks. The NTG1 is perfect for recording dialogue, foley and field recording, sound fx, you name it. What makes this microphone a ‘must-have’ is it’s a true workhorse. It sounds good, well built, it’s precise, and comes with a 10 year warranty. Like a traditional cardioid pattern mic, it picks up sounds in front of it, but it’s more precise. The reason being is due to it’s super cardioid pickup pattern which gives the illusion of zooming in on the sound that you’re pointing at while rejecting all noises around it. I use the NTG1 for creating sound effects, recording interviews and freelancing as a boom operator for local news stations. Handheld recorders are in a class of their own. They’re microphones hooked onto portable recorders. Some have preamps (like the dr40) which allow you to hook up other mics to them for better audio. But even using the internal mics produce really good results. Recording on the go! There will be times when you won’t be able to take a laptop and your audio interface with you, but you can always toss a handheld recorder in your pocket. I use the portal recorders for recording ambiances and quick ideas as well as interesting sounds I hear out in the world. I’ve used them as backup mics on guitar, drum and vocal tracks. Video work as well an audio interface! Yes, that’s right, some double as an audio interface. The Tascam DR40 hooks up via usb which allows me to use it as an interface. So in a pinch, I use it along with my Saffire 6 and utilize 6 mics. Those are the mics I own and use, what mics do you have in your arsenal? An SM58 for live vocals. An FMR-500 wireless by Telex with my favorite ND767 capsule for it’s freq. range and sensitivity with great FB rejection. Close to a Beta 58 but better. I use that for my Daugher’s voice because of her range and dynamics. I too have an old Behringer B2 that I ab’d against more expensive mics and couldn’t justify the difference in price. It sounds as if they have gone the way of most, in my opinion PAC Rim mics in the inconsistency dept. As an installer I can install for example ten American Audio Technica gooseneck mics in a boardroom a the gain and EQ will be virtually identical. Install the same using their PRO or PAC Rim series and both gain and EQ are all over the place. Same with multi packs of dynamic mics. I have some Shure and AT mini/lapel condensors I use for soundhole pickups. I am considering purchasing a Rode NT1-A for recording vocals in a Home Studio. This is roughly 200 dollars where I live. The main alternative is the Shure 58, or possibly the Shure Beta 58 A which has roughly the same prize (200 bucks). I can afford one of them. The point is: usually I see that a large membrane condenser mic is preferable to a dynamic mic to record vocals. Therefore the Rode NT1-A would be preferable (?) What do you think? I see that you present here a Studio Projects B3 for the same goal and roughly same prize. So… which of these 3 would you recommend me or recording vocals (not for stage)! For studio applications, I’d go with the Studio Projects B3.